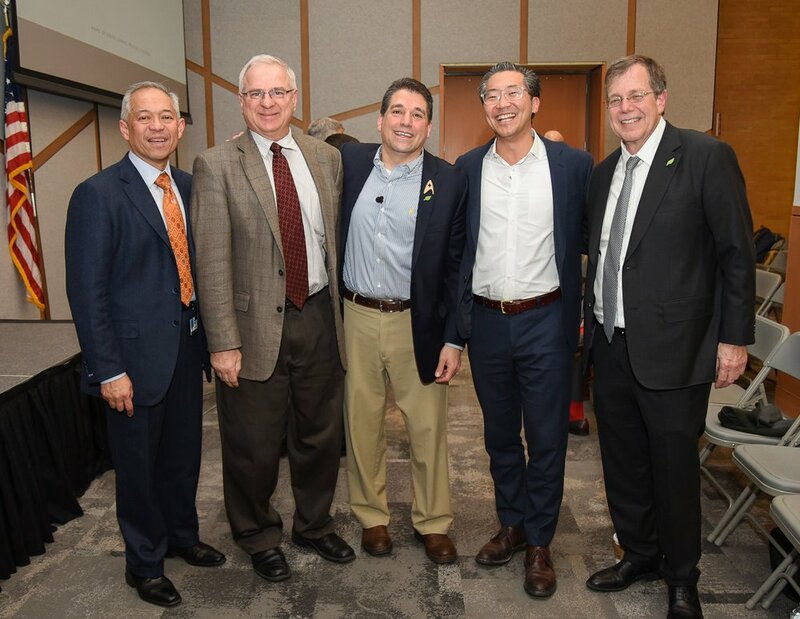 Alumnus Basil Harris, MD, PhD, endured the crucible of the Qualcomm Tricorder XPrize competition, won it in 2017 through his self-funded, family-based company, and visited Drexel to tell a packed conference room at Gerri C. LeBow Hall about the experience during the Symposium on Noninvasive Medical Technology last week. Harris’ keynote address was shot through with humor, humility and elaboration for an audience of students largely unfamiliar with the tricorder, a space-age medical tool on the television series “Star Trek.” Harris described the five-year XPrize competition to engineer one as a seemingly endless series of “building and scrapping and building and scrapping” as he and family members developed a hand-held device that can diagnose patient symptoms in real time from their homes. Many thanks to Drexel University, Drexel’s College of Engineering, Drexel’s College of Medicine, The Hellenic University Club, and to all our friends and family … especially ANGELA! NBC’s Today Show. September 2018. NBC’s Gadi Schwartz heads to Bangkok, Thailand, to take a closer at a Mongkutwatana Hospital, where robots have been commissioned to help staff and soothe patients. Schwartz also hears from Dr. Basil Harris, an emergency room physician at Lankenau Medical Center in Pennsylvania, who invented a machine capable of diagnosing 16 different diseases. The Irish Sun. 9 June 2018. By Adam Higgins. Thank you to all the participants and the amazing audience. Special thanks to Dr. Erik Viirre and The Arthur C. Clarke Center for Human Imagination! Basil was honored to participate in the Mark L. Tykocinski, MD Endowed Lecture at Thomas Jefferson University. Don't you wish you were in Cyprus? In an episode of the 1960s science fiction series Star Trek, Dr. McCoy utters one of his famous catchphrases: “I’m a doctor, not an engineer!” Basil Harris, MD ’02, PhD, happens to be both, which gave him an advantage in bringing McCoy’s “medical tricorder”—a portable diagnostic device—from television to reality. In January 2012, XPRIZE and Qualcomm announced a global competition to develop a handheld consumer device that enables people to “make their own reliable health diagnoses anywhere, anytime.” When Harris heard about it a year later, he realized that such a device would have to replicate what he does as an emergency medical physician. “We have to make these quick decisions. We have to make diagnoses with quick streams of basic information,” he says. Harris has a master’s degree in structural engineering from Drexel and a PhD in engineering from Cornell, where he became interested in bioengineering and modeling medical systems. That led him to SKMC, where he worked on biomechanics with Alexander Vaccaro, MD, PhD, MBA, and Alan Hilbrand, MD, at the Rothman Institute. After graduation, Harris completed a residency at Jefferson in emergency medicine and has worked in the Lankenau Medical Center emergency department since. Of the 300 teams that joined the pursuit of the Qualcomm Tricorder XPRIZE, Final Frontier Medical Devices and Dynamical Biomarkers Group were both announced winners at the Qualcomm Tricorder XPRIZE awards ceremony on April 12, 2017. Final Frontier Medical Devices was announced the highest performing team and received $2.6M for their achievement and Dynamical Biomarkers Group received $1M for 2nd place. Both teams exceeded the competition requirements for user experience, nearly met the challenging audacious benchmarks for diagnosing the 13 disease states, and with their prototypes, have taken humanity one step closer to realizing Gene Roddenberry’s 23rd century sci-fi vision. XPRIZE congratulates Final Frontier Medical Devices and Dynamical Biomarkers Group on their amazing achievements. In celebration of efforts that inspire others to take risks and strive for “moonshots”, even if ultimately they do not win the XPRIZE, team Cloud DX was also recognized as XPRIZE’s first Bold Epic Innovator receiving $100,000, sponsored by Qualcomm Foundation. SYFY WIRE: Star Trek Just Got Real with Tricorders in Space. If Star Trek ever had you wishing that a checkup to make sure you live long and prosper was as easy as being scanned with a tricorder, the handheld diagnostic device will soon beam down to earth and up into space. While you might not have your blood pressure checked by the nameless hologram doctor in Star Trek: Voyager (whose version of the gadget is the most akin to what we’re seeing today), these things will soon be taking vitals in emergency rooms, battlefield hospitals, refugee camps, and yes, the final frontier. Even the team that prototyped this thing is called—you guessed it—Final Frontier Medical Devices (FFMD). Oh, and they’re all bona fide Trekkies. FFMD development team member Philip Charron confirmed that he and his colleagues are all “Star Trek nerds.” That would probably be why their lightweight device, whose digital brain can monitor vital signs and diagnose a number of commonly occurring health conditions, won first place in the Qualcomm Tricorder X Prize competition. Their model is called DxtER and ironically pronounced just like the name of the serial killer on the smash Showtime series. Creepy coincidence aside, it was designed through the quick-thinking lens of emergency room doctor and FFMD co-founder Basil Harris. Artificial intelligence will give DxtER non-invasive diagnostic abilities that can confirm you have a raging sinus infection thousands of miles from Earth. "It would be amazing if the tricorder actually made it back out into space again," said Charron, with Mars in mind. "That would be a great application for something like this." A tricorder may soon be an essential part of every voyaging astronaut's tool kit, and not just on "Star Trek." Handheld diagnostic devices akin to the tricorders famously wielded by doctors in the "Star Trek" universe are poised to find their way into people's homes, emergency rooms, refugee camps, battlefield hospitals and perhaps even the final frontier, developers of the gear say. "All of this is all going to be possible in a short period of time," Philip Charron, a member of the Final Frontier Medical Devices (FFMD) team that developed a prototype tricorder, said Monday (July 31) at the 69th AACC Annual Scientific Meeting & Clinical Lab Expo in San Diego. The original 1960s Star Trek series took place in a universe of the future with personal communicators, holograms, and the technology to send humans beyond our solar system. In many ways that future is here. We have smartphones, virtual reality, space travel — and now the tricorder. In the show, the tricorder was a handheld medical device that could scan a patient, read his or her vital signs, and diagnose problems in minutes. A working prototype invented by a Philadelphia-based emergency room physician Basil Harris may not look like the ones used by Dr. Leonard "Bones" McCoy and Commander Beverly Crusher throughout the sci-fi series, but it's advanced enough to offer a medical diagnosis in minutes and anyone can use it.